We will collect and store all of your mail and deliveries at Maker + Co at 75 Victoria Street. Come in anytime through business hours to collect. Depending on the package you decide to take out, you can enjoy either 30% or 50% off all bookings for our private meeting rooms. Perfect for hosting meetings with clients. Having a virtual office means that you don’t have to give out your personal address to clients and business contacts, keeping your personal and professional lives seperate. Ready to give our virtual office a go? Flick us a message with any questions or queries you may have and we can get you started! Want more than just a virtual office? Hire out a real office and come co-work at Maker + Co for a day, week, month or year! 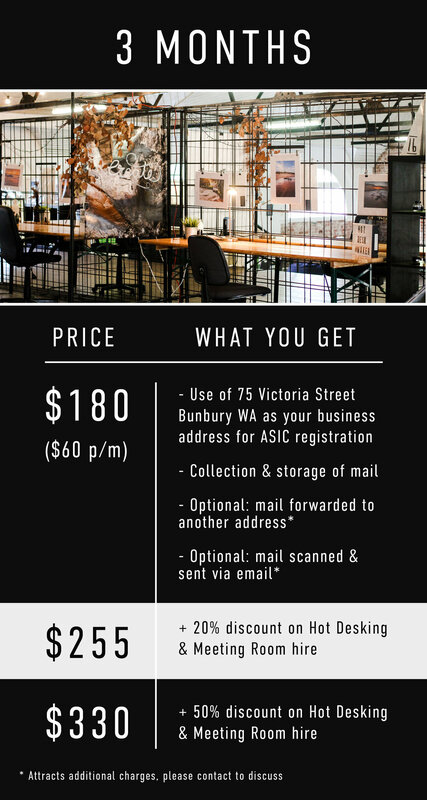 Connect, create and concentrate in your very own work-station and enjoy a refreshing office vibe in Bunbury’s CBD.